1byone is a Global Leader in TV Accessories. Come Join Our 1byone Family of Over 5 Million Satisfied Customers and Counting! 7. Mounting pole not included - Put B013057BDU or B01MZ21OFD into Amazon search box for 1byone pole. Free for Life - Never pay hugely expensive cable or satellite fees again! Get all your local channels crystal clear and absolutely free! The 1byone amplified antenna can pull in all of your local news, sitcom, kids and sports programs in full HD. Simply connect the antenna to your TV using a coaxial cable, perform a channel scan, and in minutes you'll be enjoying free local HD programming. The Best Picture and Sound Quality - You can now experience HDTV in the highest quality picture and sound available. Over-the-air broadcasts are transmitted in uncompressed full HD (1080P), ultra HD (4K), and 3D channels, far surpassing what cable and satellite offer. Many local broadcasts are digitally aired in Dolby 5.1 Surround Sound giving you the ultimate sound stage for watching live television. 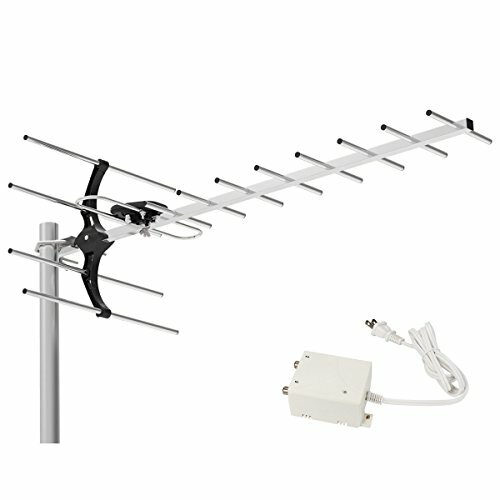 Receive Free Local HDTV and UHF Signals - Optimized for 1080P digital reception, the 1byone outdoor tv antenna allows you to pick up free local UHF high-definition and standard definition signals. Superior Construction - The cross-phase, multi-element design is built with superior construction to withstand tough outdoor weather conditions. Maximum Range: 150 Miles. Buyer Guarantee - We stand behind our antenna 100% with a 12-month warranty. Please note that over-the-air reception is dependent upon environmental factors and we cannot guarantee reception in all conditions. We do offer a 30-day money-back guarantee on all orders to allow you to test the antenna's suitability in your area.